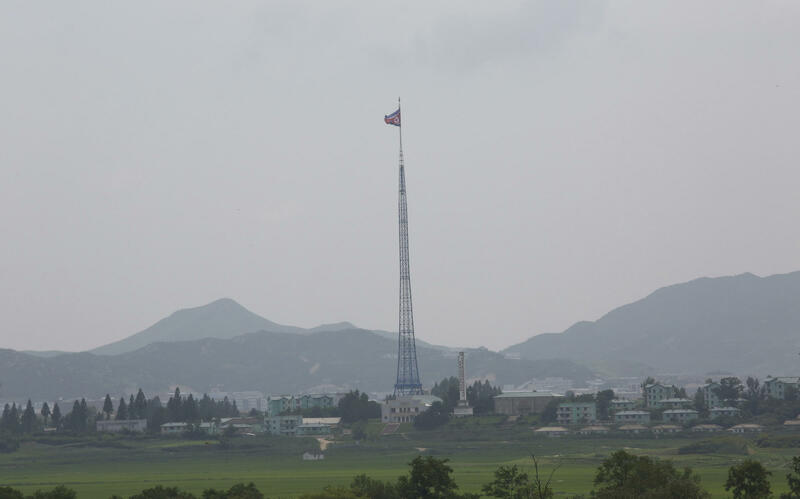 A giant North Korean flag flutters from a 528-foot pole near the border with South Korea. Tunnels built by North Korea's military are believed to extend across the border. Along with training thousands more troops, officials say the Pentagon is buying more specialized gear needed for tunnel operations: radios and night vision goggles, along with acetylene torches and bolt cutters. Officials say the additional Army brigades that will take part in the training this year include the 101st Airborne Division and the 82nd Airborne Division. Spokesmen for those divisions would not comment on the additional training, and neither would the Army. Officials say the training is expected to take place throughout 2018, most likely at home stations, although there are additional training facilities around the country that include abandoned tunnels and bunkers. "I think it's necessary, not just for U.S. troops but for South Korean troops as well," said Dave Maxwell, a retired Army colonel who served in Korea and now is with the Institute for Corean-American Studies, a nonprofit, private educational and research group. "There are about 5,000 of these tunnels. The North Koreans are like mole people." For years, U.S. officials have warned about these tunnels. Former Defense Secretary Donald Rumsfeld, at his confirmation hearing in 2001, called North Korea "world class tunnelers." "They have gone underground across that country in a way that few nations have done," Rumsfeld told senators 17 years ago. "They have underground emplacements of enormous numbers of weapons." And those tunnels, so far below the surface, would be safe from most missiles and bombs dropped by aircraft or fired from the sea. Any military action against North Korea would include U.S. and South Korean troops assaulting those tunnels, officials said. The Army usually trains one or two brigades in tunnel warfare, so large numbers of soldiers are prepared to maneuver and fight in such closed environments, in places like Afghanistan. But with the threat posed by North Korea, the Army is training additional brigades, although the exact number is classified. Just last month, U.S. soldiers from the Army's 5th Cavalry Regiment trained to infiltrate a bunker at a semi-abandoned base north of Seoul. It was a stand-in for a chemical weapons lab. The soldiers used specialized radios and night vision goggles, as they crept into the half-mile-long tunnel. "We can't just look at military operations in two dimensions," Lt. Col. John Moris told Stars and Stripes newspaper. "We have to look at three dimensions and the subterranean component." With North Korea moving ahead on its missile and nuclear program, tensions are mounting and some in the Pentagon are saying that more training and planning are necessary. Those tensions include incendiary statements from North Korean leader Kim Jong Un and President Trump during the past week. "The nuclear button is always on the desk of my office," said Kim Jong Un. "They should accurately be aware that this is not a threat but a reality." Trump responded on Twitter, saying, "I too have a Nuclear Button, but it is a much bigger & more powerful one than his, and my Button works!" U.S. Ambassador to the U.N. Nikki Haley, speaking on ABC's This Week, defended Trump's tweet. "We want to always remind them we can destroy you, too, so be very cautious and careful with your words and what you do," Haley said. Defense Secretary Jim Mattis has not spun up the rhetoric and has consistently said diplomacy and sanctions are part of the current course of action. Still, Mattis told a U.S. Army conference last fall that the service must be prepared for any eventuality. "Now what does the future hold? Neither you nor I can say," Mattis said. "So there's one thing the U.S. Army can do, and that is you have got to be ready to ensure that we have military options that our president can employ if needed." The Army's top officer, Gen. Mark Milley, said at the same conference that a "full blown war on the Korean Peninsula will be horrific by any stretch of the imagination." "It would be horrible, there's no question about it, but so would an intercontinental ballistic missile striking Los Angeles or New York City. That would be equally horrible," he said. Officials say that among the Joint Chiefs of Staff, Milley is particularly focused on the North Korean threat. Meanwhile, the Army is buying more bridging equipment to be used on any possible military action in North Korea. Military planners do not want U.S. heavy armor to rely on North Korea's questionable infrastructure when fording rivers. One of the items used by the Army is what's called the "Joint Assault Bridge," which is an Abrams tank that includes a collapsible bridge that spans 62 feet. At the same time, the Pentagon over the past several months has quietly added more Patriot missiles and precision-guided bombs in the region to make sure the stockpiles are sufficient for a war footing. North Korea's leader, Kim Jong Un, and President Trump have been trading threats and personal insults. It's even gotten to who has the bigger nuclear button. Now, the U.S. secretaries of state and defense insist that despite that, they are still pursuing diplomacy. But that does not mean the United States is not preparing for a different scenario. Here's Defense Secretary James Mattis speaking last fall. JAMES MATTIS: Now, what does the future hold? Neither you nor I can say, so there's one thing the U.S. Army can do and that is you have got to be ready to ensure that we have military options that our president can employ if needed. GREENE: Military options when dealing with North Korea. Those are some pretty strong and important words that we should explore more with NPR Pentagon correspondent Tom Bowman, who's here. Hey, Tom. TOM BOWMAN, BYLINE: Hey, David. GREENE: So what have you been looking at? Are there actually options being, I mean, considered for North Korea? BOWMAN: Well, one of the things the Army is doing is training many more soldiers, thousands more soldiers, in tunnel warfare. Now, usually, the Army has one or two brigades - and a brigade is about 4,000 soldiers - trained in this kind of activity. They want to double, maybe even triple the number of soldiers because North Korea is basically honeycombed with tunnels and bunkers, thousands of them. And this is all an effort just to get ready should the president say, it's time for military action against North Korea. GREENE: So for decades, the north has been - what? - building this network of tunnels anticipating a possible war with the south or the U.S. or somebody? BOWMAN: ...Can be put in these tunnels and rolled out when need be. Now, they've discovered some of these tunnels under the demilitarized zone and some have even gotten closer to Seoul. One is now a tourist site in Seoul that people can go into. BOWMAN: I'm not sure if that's one, but it could be. GREENE: Maybe they've recreated it. But I'll certainly go there next time and it won't be as much fun with all these tensions that are there. How much does the U.S. know about these tunnels? It's not like this is a country that, I presume, they can get a ton of intelligence from. I mean, do they have a good sense of what these tunnels are like, where they are? How much prep can they actually do? BOWMAN: Well they can see from satellites some entrances and exits from some of these tunnels. They know there are thousands of them and, again, hundreds of feet deep. But again, if there is military action against North Korea - and some of them are so deep, you're going to have to send soldiers, U.S. soldiers, South Korean soldiers, into these tunnels to either, you know, find nuclear weapons or chemical and biological weapons because they're so far underground, they're going to be, you know, not be able to be taken out by bombs or missiles. GREENE: Totally different kind of warfare it sounds like. BOWMAN: Absolutely. And I'm told that the soldiers from the 101st Airborne and the 82nd Airborne are among those soldiers to have to get this kind of training. They've also bought specialized equipment, bolt cutters, acetylene torches, special night-vision goggles because in the tunnels, there's no ambient light, special radios as well. And they're going to be training throughout 2018. But I think it's important to note that this is just getting ready. Defense Secretary Jim Mattis has said the Army must be ready. This does not mean that the U.S. is inching closer to war. It means, as Mattis said, the Army has to be ready if the president needs options. GREENE: OK, so this is the kind of thing that might go on with different scenarios that the military is considering around the world. GREENE: But it is noteworthy that they are specifically looking at the situation in North Korea and what the U.S. military could confront. BOWMAN: Right. And the Army's doing this quietly. They're not basically coming out and putting out press releases about this training. GREENE: That would probably not be the best idea. BOWMAN: Right. It is very quietly being done. GREENE: NPR Pentagon correspondent Tom Bowman. Tom, thanks. BOWMAN: You're welcome, David. Transcript provided by NPR, Copyright NPR.